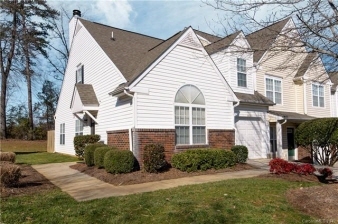 Description: You don't want to miss seeing this townhome in South Charlotte because these sellers know what buyers want and they made it happen! Tucked in the quiet rear section of the neighborhood and an end unit...this home shines like a new penny. Updated kitchen includes quartz counters, SS Appliances, and the cutest little eat in breakfast nook...plus plenty of cabinets and counter space. Baths have been updated too...just look at the pics and see. All new wood flooring, carpet & paint. The 3rd bedroom/loft area can be closed off to make a private 3rd bedroom or it can be used as an office. All bedrooms have walk-in closets. And lot's of natural light give it an open feel with great flow. If you need additional guest parking, it's right across the street. And to top it all off...it's close to everything you want or need with highly recognized schools to boot. You'll love calling this place HOME!